In train stations in England, you’ll see the words “mind the gap” regularly. It’s a reminder for people to avoid getting their feet – or anything else – stuck in the narrow gap of space that exists between the incoming train car and the passenger platform. 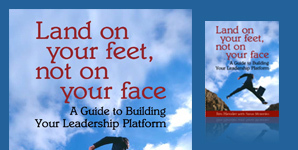 In our book “Land On Your Feet, Not On Your Face” we use the gap idea to visualize the role of vision in leadership. What we say is that leaders are people who see the “gap” that exists between what is, and what could be. We suggest that leaders are people who courageously leap that gap, excited as they are by the possibilities that exist on the other side. Leadership is driven by a restlessness to create positive change, and to create change, the people in the organization need to look into that gap with honesty, courage, and a commitment to achieving what’s possible. The gap between “now” and “then” contains all the work we need to do to get to the vision – as well as all the opportunities and risks involved in that movement. The problem in many organizations is that not enough people are actively looking into this gap. I suppose we could say simply that some people are visionaries and some are not. We could suggest that this propensity to look into the gap, containing as it might some things that scare the hell out of us – is a characteristic of natural leaders – those people among us who are just looking forward as a matter of their personality and style. However, the good leader invites the entire organization to look into the gap with them – to welcome them at first, but ultimately to hold them accountable for understanding the big picture, to assess and own the risks, and be fully immersed in the anticipation and fear that are always present with a view of the future. It’s not enough to have a brain-trust at the top of the organization “minding the gap.” Everyone should be minding the gap for the organization’s opportunities to be fully realized. Also, leadership needs to be transparent enough for the organization’s workers to understand the big picture. Don’t blame people for not seeing the gap – and don’t just write people off for lacking vision. Instead, point their eyes towards it and have them see it with you. Most employees are never invited into this discussion or ever held accountable for being part of the visioning process. There will be tension as a result, but it will be the kind of growing edge tension that a good leader can convert into forward momentum.